5 Delicious Flavors Island Thyme - Herbal Blend of Rosemary / Sage/ Thyme Calypso Kick - Smoked Habanero Calypso - Mild Season All Jamaican Jerk - Jerk seasoning straight from the Island of Jamaica Lemon Garlic For the most variety we have to offer, get a 5-pack that includes all of our Caribeque seasoning blends! Try them on pork, chicken, beef, seafood, or make delicious veggies and fries. This variety pack contains one 5 oz shaker bottle of: Calypso Original Season All, Calypso Kick Spicy Season All, and Island Thyme Herb Seasoning Blend, plus a 4.5 oz shaker bottle of our Spicy Jamaican Jerk Seasoning Blend and a 6.3 oz shaker bottle of our newest Lemon Garlic Seasoning Blend. 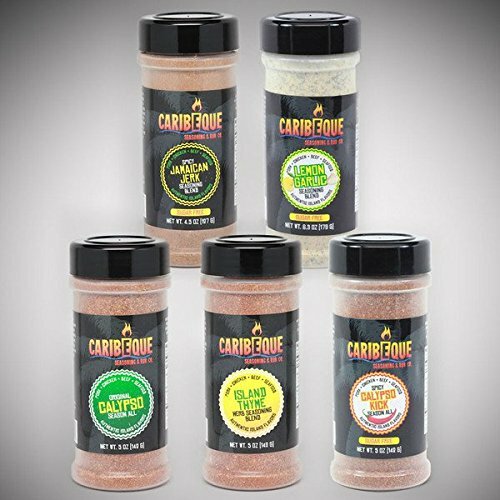 The entire Caribeque line is gluten and MSG free, low sodium, and has less than 1 gram of sugar per serving (Jamaican Jerk, Calypso Kick, and Lemon Garlic are all sugar free). We do not add any anti-caking agents to our product, so they are 100% natural spices that will liven up every meal. We hope you enjoy our products as much as we enjoy creating them for you! If you have any questions about this product by Caribeque Seasoning & Rub Company, contact us by completing and submitting the form below. If you are looking for a specif part number, please include it with your message.